From recent acquisitions to our archives, we selected these pictures which portray some of the early building and flying experiences of EB George "Eddie" Barnhart. In the picture above, we see Eddie holding a strut of the 1910 glider which he designed, built and flew. This glider had wheels on which to land after taking off from the Sierra Vista Hill northeast of Los Angeles. Two years later, in May, 1912, he was flying the "modern" 1911 airplane which he had designed and built. 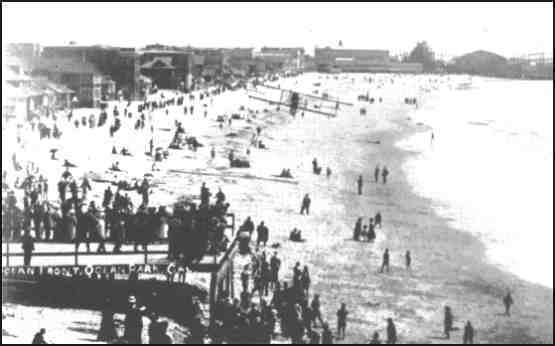 Eddie's craft winning its world's record for flying every day on schedule in exhibition flights to Ocean Park, California. Later, this craft made a cross country flight from Ocean Park to Long Beach, and was used in many exhibition flights of that time. He continued his efforts in plane design and construction, and one plane was designed, built and flown by him all in a six week's period from May 1st to June 15th, 1915. That plane was later used in stunt flying and in the movies. About September 15, Pasadena will witness the trial flight of the first commercial passenger airplane ever built in the Crown City. Eight years ago a small plane was built here that flew thirty days and then went into the scrap heap, but the one now building is a large four-passenger-and-pilot airplane that is first in a number to be built in a Pasadena establishment and will be the genesis of an airplane factory that its builders hope to make the premier industry of the city. The plane is being assembled now at 40 West Green street, where the builder, C. R. Little, surrounded by a force of experts, is putting the finishing touches on the frame and body, and the motors will be installed next week, it is hoped. G. E. Barnhart is the engineer in charge of the craft building and L. G. Stearn is the factory superintendent under whose supervision the workmen are putting the big machine together. The plane will have a spread of fifty feet, but the wings are so hinged that it may be housed in a twenty-two-foot hangar or garage. The machine will embody a number of features that will make it an improvement upon all others now in use. It will have two O. X. 5, Curtiss motors, which Mr. Barnhart believes to be the most dependable for the type of car being constructed. One of the exclusive features is a control by which either or both motors may be operated as desired, a simple turn to right or left starting either motor and a pull putting both into running. Another feature is a centrifugal pump that will pump sixty gallons of gas an hour when but twenty is required. This is a powerful pump occupying small space and very efficient. The wood work of the spars is of box construction making them light and strong and other wood parts are laminated so that grains run in different directions giving strength with lightness. A waterproof glue had been invented that makes possible the glueing of the wooden parts so that exposure to weather will not affect them. The metal parts are copper plated and then nickled to prevent rust. The struts are laminated and possess all the desired strength. The body of the car will have four seats for passengers and it will be finished in leather and fabric with rubber mats. Windows will permit the passengers to look out and a lense is placed in the bottom of the plane so objects below may be viewed magnified. Every comfort for passengers is to be added. The pilot's seat folds back so the passengers may enter the car from the bottom and take seats in an enclosed limousine car. The portions of the car painted will be of a maroon color, most of the woodwork being left finished in natural wood. The car probably will be tested from the Municipal Field at Altadena when ready, being transported there by trucks. It is unnecessary to dismount the car to move it about as the tails and rudder can be placed on a truck and the whole moved as a unit. When completed, members of the press and city officials are to be invited to soar over the ciry as guests of the builders and be shown what can be produced here. It is the idea of the builders that an airplane factory is just in the right class to be an acceptable industry to Pasadena that will add to the fame of the city as it will be known world wide as a Pasadena built airplane. Mr. Barnhart built a plane at Los Angeles in 1916 that still is flying so that he is no tyro in aeronautical engineering. He is a member of the American Aeronautical Society and his associates are all skilled builders. He is much pleased over the fact that the airplane has gone together just as the planes call for it. Experiments are now being conducted to perfect an electrical control by which the motors may be started from the pilot house without hand effort being applied to the propellers from the ground. This when added to the new airplanes will make them complete in every detail. Dorothy Paddock, 7, daughter of Mr. and Mrs. Sherman Paddock, christened the aircraft the day before. She used a spray of Cecil Brunner roses instead of a bottle of Champagne, with, as one newspaper put it in the style of the day. "the sun smiling its blessing and the majestic Sierra Madre peaks in their serenity guarding the tranquil valley." According to the Star-News; "with a mighty roar that could be heard for blocks, the big plane took off with three passengers and the pilot." It is not known if the writer lived to see today's giant planes and hear the roar of jet engines. Richard Mulvin of South Pasadena read a more recent mention of the Wampus-Kat in the Star-News and sent a clipping with a letter to a friend, the plane builder's daughter, Patricia Barnhart Youngs, thinking she might have a picture of the aircraft. Mulvin also knew how the dream of the plane's builder, George Edward Barnhart, had been smashed by a powerful wind, perhaps a twister, which destroyed the plane and its hangar, ending his hope of establishing an aviation industry in Pasadena. "This hangar was on the Altadena Golf Course," Barnhart said later in a Paul Coates radio interview. "We had everything in our hands, but with that destruction there wasn't a person in town that would loan you a dime or even look at you. Aviation was dead. There were no dollars. There was nothing. You were completely lost." Today Barnhart's daughter lives in Minnesota in the summer and in Yuma, Ariz, in the winter. She sent copies of news clippings, letters and other material on her father and the plane he built at 425 E. Green St., Pasadena, but no photograph. Mulvin learned that her cousin, Charles R. Little, Jr. of Pasadena, had a collection of memorabilia, including photographs. Little's material had belonged to his father, who had financed building of the plane. He was graduate of Throop Polytechnic Institute, a forerunner of Caltech, with special instruction in engineering. At 22, before he built the Wampus-Kat, he designed a powered biplane and in six weeks built it with the help of six men. It flew for 10 years - to 1925. Hollywood movie making was just getting under way when at 17, Barnhart built a rickety biplane for use in a film stunt. The cameraman was afraid to let the teen-ager fly his own plane and a stunt flier was hired to handle it. But Barnhart lay flat on the lower wing, hanging on to a strut, and gave instructions to the pilot on what to do as the plane was filmed from the ground. While Barnhart worked with such stars as Mary Pickford and Pearl White, his real love was the airplane. He worked for the leading plane makers of the area and developed 70 inventions. One was the wing flap, still used by planes on taking off and as an air brake. He gave the patent to the United States Government for use in war planes during World War II, but never got it back and never got any money for it. His 70 patents ranged from devices for planes to a seamless metal golf club shaft. He was honored by Gen. George S. Patton for producing the first model of a 50-caliber, four-gun, hydraulic-operated turret capable of operating under desert conditions. THE BARNHART TWIN NO. 15 "WAMPUS-KAT"
The latest development in American moderate sized commerecial transport aeroplane is shown in the Barnhart Twin No. 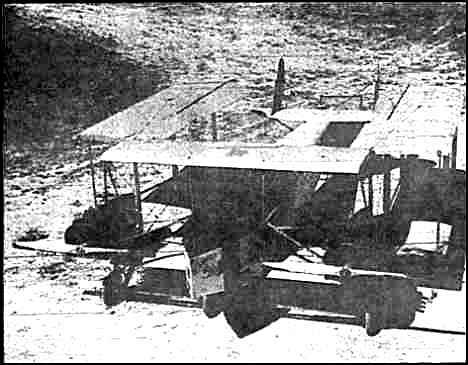 15 "Wampus-Kat," a new product of the C. R. Little Aircraft Works of Pasadena, California. Before the work of designing and constructing the machine was started, one year was spent in planning and investigating the need for a commercial aeroplane that owuld assist in establishing the commercial use of aircraft. Mr. G. Edward Barnhart conducted this investigation and as a result incorporated into the design of Elton is carrying on the expansion of the organization, sales and works. Mr. R. Short and Mr. Wally Timm, in a Barnhart machine, flew over and dropped quantities of flowers on the new machine. "The performance of the ship shown in the test work done so far is remarkable. The motors both turn the same R.P.M., but are about 100 R.P.M. under normal. This would indicate the propellers were not proper for the engines. It will be within reason to expect a further increase in an already fine performance as we know a J. N. with the engines turning at 100 R.P.M. under normal would not get off under the same conditions. "The Dep" control is used, and is very efficient. The control ratio seems to be correct, and very little movement on the wheel is necessary. The ship has at least fifty per cent more aileron than even an exceptional condition would call for. This control is very natural, both in movement and in results. Barnhart Twin No. 15, "Wampus-Kat" the features that would satisfy the needs of commercial aviation. MR. L. G. Stern, who has over ten years experience in aircraft construction, during which time he has held many responsible positions, is the shop super;intendent, and personally supervised the construdfction of the "Wampus_Kat." The establishment and construction of the Barnhart Twin No. 15 "Wampus-Kat" was financed by Mr. C. R. Little, a retired business nam, who has unlimited faith in the future of commercial aviation. Mr. Murray S.
Side-view of the Barnhart "Wampus-Kat"
AUTOGRAPHED AIR MAIL COVER This cover which originated from THE NEW YORK AVIATION SHOW, under the auspices of AVIATORS' POST No. 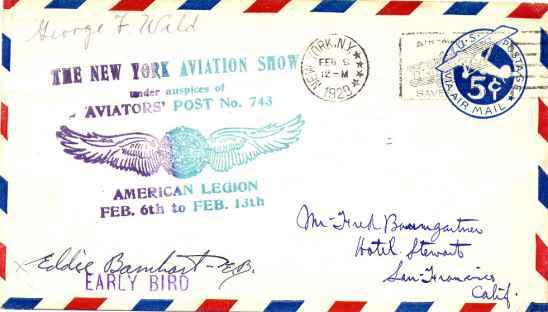 743, AMERICAN LEGION, FEB. 6th to FEB. 13th and was signed by EB George "Eddie" Barnhart, is postmarked New York, N.Y. on Feb. 6, 1929. It has been donated through the courtesy of Stéphane Sebile. Brief Illness Takes Flyer-Inventor A pioneer flyer and inventor, George E. Barnhart of Altadena, Calif., died April 25 after a brief illness. He was 66 and a native of Pasadena. Funeral services held on May 1 were attended by Early Birds Charles Willard, Warren Eaton, Buel Canady, Forrest Wysong, Walter Claverie, Carl Batts and Ivan P. Wheaton. As a youth of 14, Mr. Barnhart began flying a homemade glider. 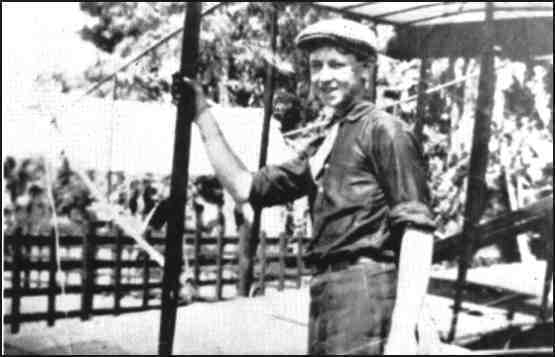 In 1912, when he was 17, he built and flew a powered airplane. During his career he invented a number of airplane components, including the wing-flap air brake, and wing tanks. During World War II, Barnhart gave free use of nearly twenty of his patents to the government "until the end of the war." The patents were never restored to him and at the time of his death he was engaged in attempts to overcome the legal technicalities that prevented their return. On feb. 17 President Kennedy signed a bill granting him permission to sue the govenment in the U. S. Court of Claims for restoration of his patents and possible payment for their use.